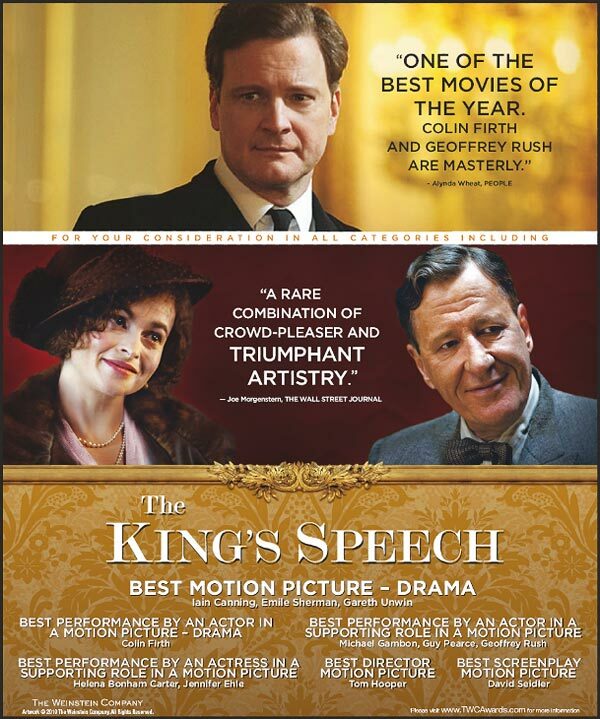 "The King's Speech" is a sure crowd-pleaser. In fact, in my theatre the entire audience applauded at the end. The film features outstanding performances from Colin Firth, Geoffrey Rush and Helena Bonham Carter who were all a delight to watch. The film really flew by, as I was expecting at least another 1/2 hour at the end, a true sign of a good movie. 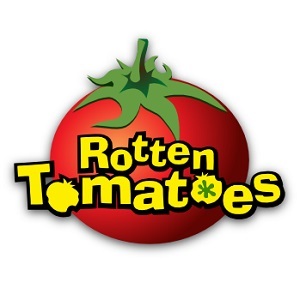 According to the "smart-money" this film will go head-to-head with "The Social Network" for Best Picture. After seeing it, I can definitely see why (although I think "The Social Network" should be the frontrunner). Firth and Rush also deserve all their praise and Bonham Carter also deserves a nomination, although she faded away as the film progressed. Expect nominations to come in Directing, Original Screenplay, Editing, Art Direction and Costume Design as well. 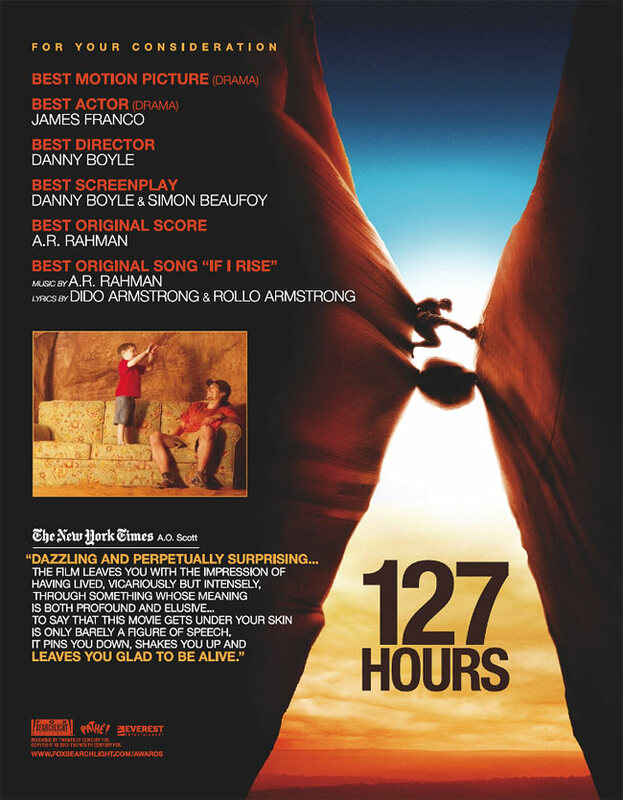 "127 Hours" is another solid endeavor by Danny Boyle. Should definitely pick up a good spread of Oscar nominations. The directing was focussed, creating a very intimate atmosphere, as if you were stuck in the cave with James Franco's character. This character was the highlight of the movie, as Franco put in an outstanding performance carrying the movie all on his own. His performance in "the scene" (if you know the basic plot, then you'll know what I am referring to) was enough to warrant a Best Actor nomination. The short running time (94 minutes) of the film held the audience's attention, avoiding the mistake of trying to stretch out a very simple plot. I would consider this film a strong contender for Best Actor, Best Director and Editing. Should also be a lock for nominations in Best Picture, Adapted Screenplay and Cinematography, but I would be very surprised if it won awards in these categories. I recommend this film, but be warned. This film is not for the faint of heart! "Damn, that was soooo witty!" That's all I kept saying after watching this excellent film. I really didn't want this movie to end, when those typical "Where are they now?" lines came up at the end, I was actually in denial. This film was such a great collaboration. The screenplay was outstanding, such smart comedy in addition to some really gripping moments. 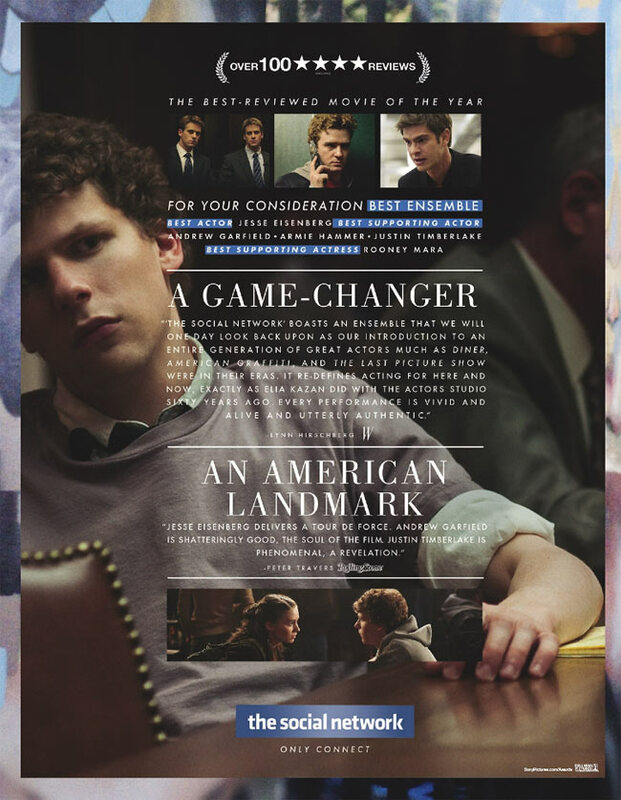 The cast all worked beautifully together, with Jesse Eisenberg particularly giving a surpringly confident performance. This thing is a lock for Best Picture and I have no doubt that it will be in the top 5 for Oscar contention. This movie has a lot going for it. It is so representative of the "online" society of our generation (dating, shopping, entertainment etc.). Oscar experts always talk about the importance of the relevance and timing of a film and I can't think of a more current and relevant film. Eisenberg deserves a Best Actor nomination and Garfield was also good in his supporting role (even Timberlake did a good job). Certainly should get attention for Director, Adapted Screenplay, Original Score and Editing as well. I reccommend this movie to all my friends. I'm so excited to watch the other frontrunners (The King's Speech and 127 Hours) now. Yes, I know it's strange that I haven't seen "Braveheart" until now, but I can explain. Back in the 90's I was too young to watch these movies(and I was a very disciplined child) and I was more interested in the next Pokemon movie anyway. By the time I really became a movie buff, I was more interested in the new releases. Anyway, back to "Braveheart". Really one of those genre-defining films (when you think of epic movies, how can you not have this on your list?). A bit overdramatic at times, but I guess it was appropriate for the context. Mel was surprisingly believable in his role too and really showed his talent as a director. Whoa, didn't see that one coming. Don't want to divulge any more, as it would ruin the movie if you intend to watch it. Awesome cast, especially Edward Norton who was really great in his role. If you haven't seen this, you should.